EirMed performs mold flow analysis on your part designs using the newest SolidWorks software, featuring integrated design and mold flow capabilities. Our mold flow analysis helps to make determinations of what materials are needed, and can identify potential failure points for the mold and the part design. Modern medical devices are required to be light, strong and ergonomic. Our engineers perform a mold flow analysis prior to the fabrication of the tooling, to evaluate that all requirements of the design can be met. During the analysis, we are evaluating gate locations, wall sections, knit lines, sink areas, material viscosity and molding parameters to determine the best options for achieving the necessary results. 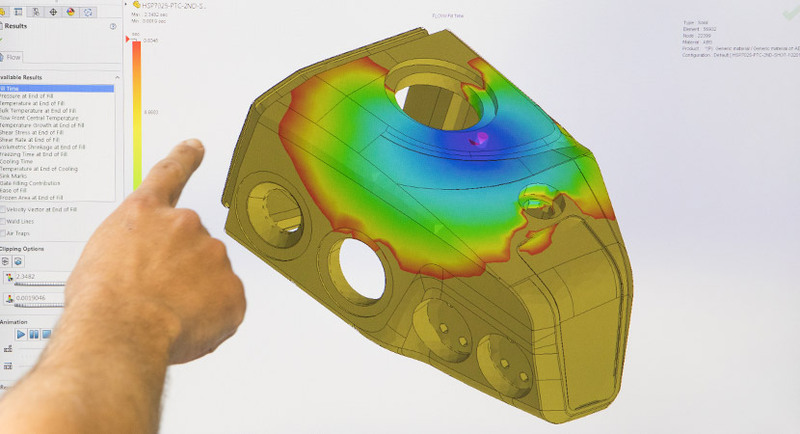 This analysis enables our team to make any major or minor adjustments needed for successfully molding production parts. EirMed is ready to provide your next medical solution through our highly innovative software, experience, and capabilities. To learn more about our mold flow analysis capabilities, and how they fit into the larger framework of design and engineering services we provide, request a consultation with one of our experts.